This report was prepared for the New Jersey Conservation Foundation (NJCF) by the Institute for Energy and Environmental Research (IEER) and PSE Healthy Energy, working closely with ReThink Energy NJ and NJCF. 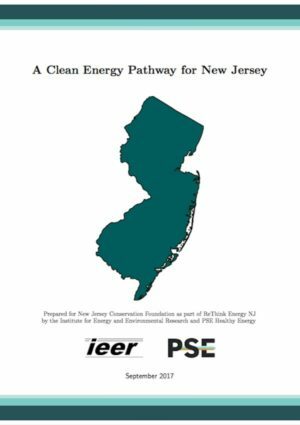 It is the final report of a project to develop a clean energy pathway for New Jersey with a focus on the year 2030, with deep decarbonization of the electricity sector by 2050. This will help the state meet its goal of 80% greenhouse gas emissions reduction from all energy sectors by 2050 under New Jersey’s Global Warming Response Act (GWRA). In summary, we find that a 50% reduction in power sector emissions is necessary, achievable, and affordable with the deployment of 33% in-state renewables by 2030. With careful planning this transition can provide additional resilience, health, equity, economic, and environmental benefits. Our calculations indicate that the cost will be comparable to a business-as-usual approach even without including the benefits of pollutant emission reductions, health improvements, and the hedging value of fuel-free solar and wind energy against natural gas price volatility. Further, it appears advisable for New Jersey to prepare now for nuclear plant retirements though initiating Virtual Power Purchase Agreements (VPPAs) for renewable imports and through more vigorous development of offshore wind. These efforts will set the state on a path to achieve deep carbonization by 2050.